What can visitors expect to find on your website? 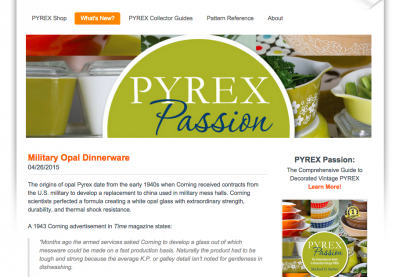 The Pyrex Passion website features a pattern reference for opal Pyrex standard and promotional bake ware, along with dinnerware patterns. 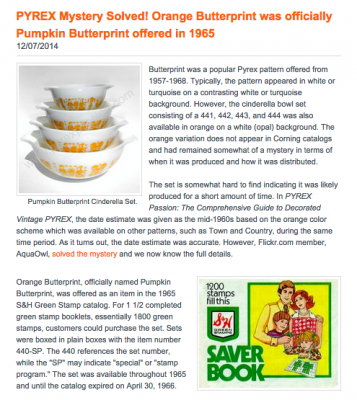 A “What’s New?” section provides an opportunity to share new information with collectors, such as product information, dates of production, or mysteries related to some patterns. I started the website about a year before the release of Pyrex Passion: The Comprehensive Guide to Decorated Vintage Pyrex. Why did you start collecting Pyrex? I started collecting Pyrex when I inherited a blue 401 mixing bowl from my mother. It was her mother’s – and the only remaining piece from the 4-bowl Primary Colors Mixing Bowl set. I researched the small bowl with the plan of selling it online. However, as I searched the online auction sites for PYREX, I discovered a world of colors, patterns, sizes and shapes that evoked all sorts of memories; the casseroles my grandma used, the plates and cups we used when I was a child, the dishes used by my neighbors. All these memories were captured in the wonderful designs of PYREX throughout the years. That’s when I was hooked. First pattern collected? The first pattern I collected was the Primary Colors Mixing Bowl Set. My favorite pattern changes from time to time, but right now I’d have to say Spring Blossom Green since that was my mother’s pattern when I was growing up. Favorite recipe? I make everything in vintage Pyrex, but can’t say I have a favorite recipe. I do enjoy finding ways to use the small individual pixie casseroles (model #700) that were produced in the early 70s. Stats on the site: The website has existed since 2012. The site gets about 12,000 hits per day – with the favorite page being the pattern reference page. 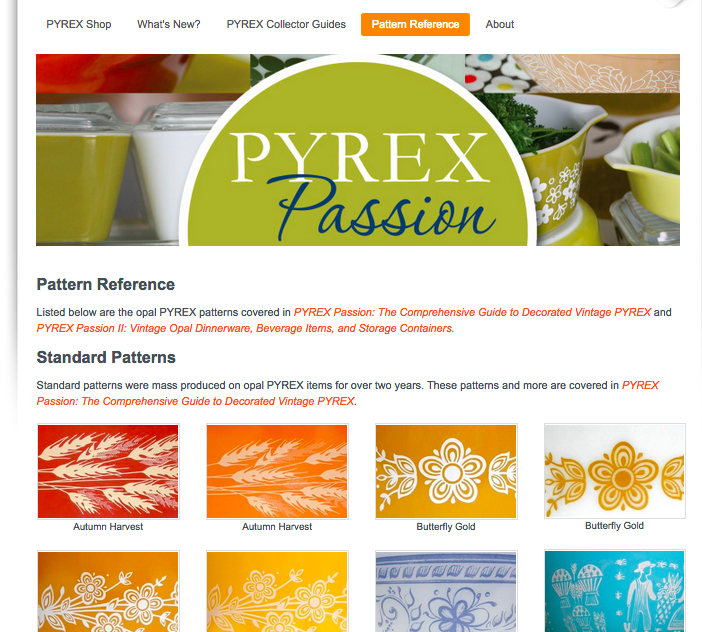 Visit Pyrex Passion at www.pyrexpassion.com and stay tuned for more featured Pyrex sites each month through 2015! America’s Favorite Dish: Celebrating a Century of Pyrex opened earlier this summer here at The Corning Museum of Glass. In association with the exhibition, we launched Pyrex Potluck, a website featuring over 2,000 Pyrex items in the Museum’s collection sortable by pattern and date. Features include digitized advertisements, articles on the history of Pyrex and clips of oral histories conducted by the staff of the Museum’s Rakow Research Library, who have gathered personal perspectives from designers, engineers, and marketing staff who worked with Pyrex products.